Managing capacity with limited resources isn’t easy for any fledgling business. Mix in the challenges of expertly juggling time and other finite resources, and it’s a wonder how small business owners get past the initial hurdles to sustain growth. For Lina Garcia and husband Edgar, owners and operators of La Puntada Loca, a custom embroidery shop, obtaining financial support from Mercy Corps NW came at the right time to enable their business to move forward. 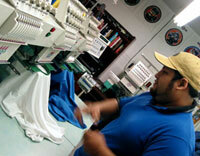 Edgar has more than 15 years' experience in embroidery and design. La Puntada Loca (The Crazy Stitch) produces custom embroidery hats, polo shirts, jackets—anything you can dream of to stitch a custom logo on. 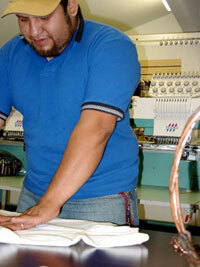 Edgar has been in the embroidery business for more than 15 years and has leveraged his experience and technical skills learned at a technical institute in Mexico. He uses computer software to translate the custom logo into a sequence of stitches and match the thread to the specific tones in the design. Lina is responsible for marketing and advertising, where her bilingual skills have proven very useful. Obtaining a loan from Mercy Corps NW, the Garcias have expanded their production capacity from a single machine with one "head," or garment slot, to a four-headed machine with the capacity to produce four custom garments simultaneously. The expansion has allowed the Garcias to acquire large clients, including Yahoo!, The School System of Oregon, Pendleton Round Up, and the Oregon Brewery Festival, who were so impressed with the quality at La Puntada Loca that they have already contracted for next year. Through their mission of igniting economic development opportunities in underserved markets, Mercy Corps NW assists in developing business ventures in economically distressed communities. Loan programs are available for microenterprise ventures. Financial education and money management training also is available to help startup businesses take their business to the next level. Before obtaining the Mercy Corps NW loan to purchase of the four-head machine, keeping up with orders for La Puntada Loca embroidery was a challenge for the Garcias. Large orders demanded long, tedious hours. Lina was working full-time, raising three children, and struggling to get orders completed on time. 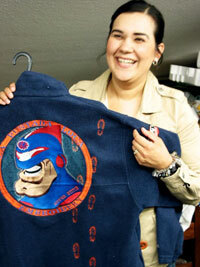 Once, the Gracias completed an order for 500 cheerleading jackets in two days, working 48 hours straight. “We took turns sleeping. The baby was six months old. We would wake each other up every three hours,” she said. While the right equipment was essential, the true success of La Puntada Loca stems from cooperation, hard work and dedication of the entire Garcia family. Six-year-old Natalia and 9-year-old Tatiana help by removing the excess backing once the logos have been stitched on to the fabric. It helps to have friends in the right places: Edgar's friends – two deejays at LaGran D 1520AM – exchange embroidery for advertising. Through their help, La Puntada Loca reaches potential clients in California, Idaho, Oregon, and Washington. Dhami, who holds an MBA from the University of Portland’s Pamplin School of Business, is inspired by the energy and passion possessed by small business owners like the Garcias. “What I enjoy most about what I do is the human component of the job: being able to link clients with resources and,” says Dhami, who is proud of her Albanian heritage. "Our staff is committed to helping business owners realize their dreams. We like serving as advocates for small business growth."